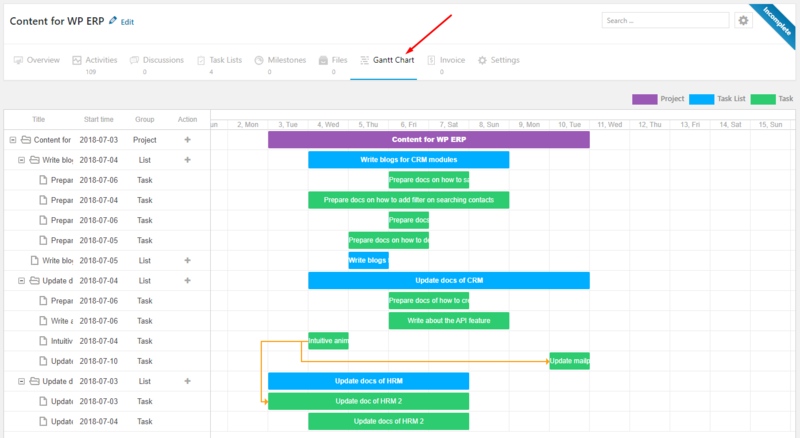 Gantt Chart is a type of bar chart that allows you to see the schedules of each and every task created within your project by WP Project Manager Pro. This document will show you how to use the features of the Gantt Chart. To activate the Gantt Chart Module go to WP Admin Dashboard → Project Manager → Modules → Activate the Gantt Chart. To access your Gantt Chart, go to Project Manager → Projects → Select any project you wish to view. After selecting the project of your choice you will see the Gantt Chart on the far right side of the menu. Click on it to view. Gantt Chart allows you to expand the duration of tasks. On the top, you will see the date, day and month. You can expand your tasks by dragging to the left or right by clicking and holding the edges of the tasks. Interestingly, you do not have to edit the due dates for the project or tasks, the due date for any task will be changed according to the graphs. If you want to push a specific task to a later or an earlier date, you need to click and hold the task and then drag and drop to your desired date. If you click and hold on a task list and drag it to the right then the due date will be extended. Similarly, if you click and hold on a task list and drag it to the left then the due date will be shortened accordingly. But, with the Gantt Chart, you can create new tasks right from the Gantt Chart tab. From here you can create a new task, assign it to your co-worker, define a due date and mark as private. Yes, it is possible. When you hit the (+) icon of the Action tab, you will get a form to add a Task List or Tasks. If you click on the Task List name field or Task name field, you will get a bunch of suggested Task List names or Tasks from the other projects. Suppose that you want to link up two or more specified tasks from the Gantt chart. You can do it by joining the circularly shaped icon of a task to the other. First off, you will have to click on a taskbar after that you will get two circles. Then you can click on one of those circles and drag them to connect with other tasks' circles. Please note that you can only hook up a later task to an earlier one and you can not connect an earlier task to a later one. You can use the (-) or (+) icons to open or close folders to navigate more easily between the task-lists and tasks. The project and task-lists are like folders while the tasks are like files. Use the (-) icon to close a folder and use the (+) icon to open a folder. After editing the Task List, don't forget to hit the “Update List” button. Please note that this double-click editing feature is applicable for the Task List and Tasks not for the Project.